The by-elections were necessitated in Thiruparankundram after lawmaker AK Bose's death on August 2 and in Thiruvarur with M Karunanidhi's death on August 7. 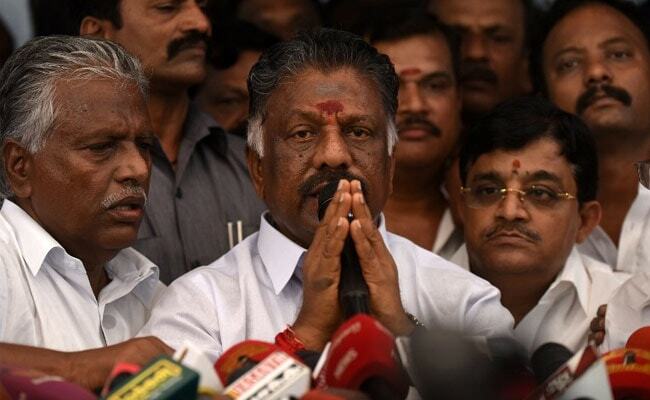 Tamil Nadu Deputy Chief Minister O Panneerselvam on Saturday said the AIADMK would contest the by-elections to Thiruparankundram and Thiruvarur constituencies and those dreaming of dislodging the state government would go into oblivion after the by-polls. The by-elections were necessitated in Thiruparankundram following the death of lawmaker AK Bose on August 2 and in Thiruvarur with the death of former DMK chief M Karunanidhi on August 7. The Deputy Chief Minister was at Tirunelveli to take part in the 303rd birth anniversary celebrations of freedom fighter Puli Thevar. Mr Panneerselvam said former chief minister, late J Jayalalithaa wanted Puli Thevar's birth anniversary to be celebrated as a government function. The AIADMK government has always taken note of the Independence struggle and its heroes, he said, garlanding a statue of Puli Thevar. Some ministers including OS Manian, Dindigul C Sreenivasan and VM Rajalakshmi also garlanded the statue. Meanwhile, Amma Makkal Munnetra Kazhagam leader TTV Dhinakaran said freedom fighters suffered a lot to get independence for the country. But the present AIADMK government and those in power have sacrificed the people's interests for self-aggrandisement and amassing wealth, he alleged. He also alleged that the present state government was subservient to the BJP-led government at the centre. "Therefore, we should overthrow this AIADMK government," he said after garlanding a statue of Puli Thevar.